Introduction: Why do forests still exist? If we look at Europe from Space, through the digital eye of a satellite, we will notice a seemingly solid structure formed of vast, dark green woodland. When we compare Europe to all the other continents we realize that Europe is actually a green oasis in the world. It is an area where forests do not decrease (as in the rest of the planet) but on the contrary have increased since the XVIII century. In Europe the the relationship between forests and society continues to evolve, turning its back on the demands for mass raw material and focusing more on the ecological aspects such as the protection and conservation of ecosystems and landscapes. There is the tendency to move away from the typical aspect of using the forest solely for timber production. This is a privilege that only a quite wealthy society such as the European can afford. In the poorer parts of the World, there is pressure for more agricultural land at the expense of forests because of the millions of starving people who use wood to survive on a daily basis. At first glance, the forests of Europe seem to be similar, however, with a closer look the local and regional differences of the most complex ecosystems appear. The boundaries between forests can be distinguished. One can see the northern and mountain spruce forests, the endless terrain of pine forests, the multi species forests on highlands and mountains, the long stretches of riparian forests, the Mediterranean evergreen bushes of macchia, and even some remains of ancient forests. All types of forests are unique depending on the different tree species, the flora and fauna diversity, the fertility of the habitat, land management and forest policy in the area which in certain areas was sometimes formed by several countries. 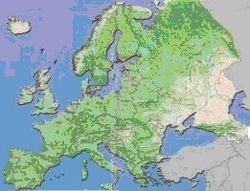 European forests are diverse in terms of the composition of species, the land they cover and the history of their management. However, they are quite similar in terms of their role in the modern world for the landscape and society. During our journey through European forests we will examine their diversity and we will try to discover the strong relationship between forests management and forests role in society. It will be a journey to forests in European countries and at the same time to forests of the past. We will start our journey from the Mediterranean and we will continue towards the north according to the chronological order of settlement in Europe. We will see how the history of our economy is related to forest resources. The first traces of settlement are 8000 years old and come from southeastern Europe, whereas similar findings in the northern part of the continent appear 6000 years later. Oak and cedar forests died out in the medieval times (in those days people struggled for their survival). Systematic forest management by people in Western Europe dates back in the middle of the last millennium. In northern Europe, management of some forests started 200-300 years ago. 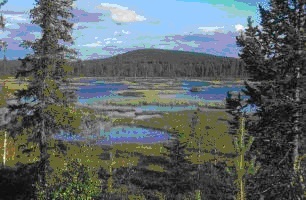 Many forests escaped the exploitation phase during the era of industrial development. Sustainable forest management started later providing also a steady income. The journey northwards will also have a different dimension. As we will follow the footsteps of the withdrawing glacier, we will pass through forest areas of different climate conditions and soil surface of different geological age.